August 13, 2018- Follow this discussion of the broader picture of restoration efforts in the Klamath Basin. June 29, 2018- Definite Plan is part of submittal to FERC in support of dam removal. June 28, 2018- Klamath Water Users Association filed objections to the Klamath Tribes call for water. June 28, 2018- One hour podcast covering water issues, endangered species, tribal rights, and water calls. June 25, 2018- For more information, please see the news release and USBR website for 2018 plans. May 24, 2018- Suit requests federal agencies provide sufficient water and address deficiencies in biological opinion. May 23, 2018- ODEQ seeks comments on the draft water quality certification for removal of J.C. Boyle dam. May 22, 2018- Approximately 20,000 acre feet of water loaned from reservoirs to irrigators in need. May 7, 2018- USBR to increase flows below Iron Gate to meet court order to mitigate and address disease concerns for coho salmon. April 23, 2018- Cal Trout and The Nature Conservancy are partnering on important restoration work in the Shasta. See more here. April 18, 2018- New report highlights stewardship actions and adaptive management approach. See details here. April 18, 2018- The spring KBMP meeting will be held at the Karuk Community Center in Yreka. See the agenda for details. March 27, 2018- Bureau of Reclamation plans to forgo emergency dilution flows required in 2017 court order. March 22, 2018- Releases begin for 2,500 2-year old hatchery raised suckers with goals for 100,000 to stave off extinction. March 15, 2018- New court filing claims flows meant to protect juvenile salmon are 'unnecessary'. March 11, 2018- 90-day finding on petition to list Klamath Spring Chinook based on new genetic data, continued disease. March 11, 2018- Listen to the JPR podcast discussing NMFS review of Klamath Spring Chinook listing review. March 10, 2018- Low snowpack, drought designations, and struggling salmon runs paint a difficult trajectory for the basin. February 18, 2018- NPR podcast discusses how rivers have changed the way American's live, work, and play. February 14, 2018- Lawsuit notice filed, possibility of extinction level event cited. February 14, 2018- Oregon senator introduces bill to prevent PacifiCorp customers from being charged for dam removal. February 8, 2018- Many questions remain about adjudication, the 2018 water year, and the evaluation of water claims. February 7, 2018- Drought declaration delayed; timing benefits to help irrigators when they need it most. February 3, 2018- Return of Lost River Sucker to the Sprague River an important tradition for The Klamath Tribes. February 2, 2018- Current warm and dry winter leave Klamath County commissioners worried about drought. January 8, 2018- The collaborative Integrated Fisheries Restoration and Monitoring Plan (IFRMP) releases their Plan Vision. January 3, 2018- The Upper Klamath Basin Comprehensive Agreement (UKBCA) has been terminated. January 2, 2018- Across the Trinity River and beyond, creeks are drying up and cannabis is to blame. December 15, 2017- KTAP summarizes results from 92 recent restoration projects in 2016 Watershed Report. November 28, 2017- PDF's of presentations from the latest KBMP meeting are available for viewing here. November 9, 2017- Open House meetings scheduled on 11/7 (Klamath Falls), 11/8 (Yreka), and 11/9 (Eureka). October 4, 2017- The story of the Elwha River, unleashed. October 3, 2017- KRRC has submitted a technical support document for the Lower Klamath Project. September 19, 2017- Despite fisheries disaster declaration, no funding was allocated to support suffering fishermen and tribes. September 15, 2017- Summary of August WQ in Agency Lake and UKL: die off of adult suckers, cyanobacteria bloom, and other issues. 8/31/17- Regional wildfire map shows increasing fire danger across the basin. Be safe everyone! August 21, 2017- Spring Chinook have been found to be genetically distinct from fall Chinook. Karuk Tribe will petition for listing. August 17, 2017- New research identifies key genetic difference between spring and fall Klamath Chinook. Article and research paper. August 17, 2017- Trout Unlimited is hiring. Help conserve and recover Oregon's native salmon, trout, and riverine ecosystems. August 15, 2017- The newly released IFRMP Synthesis Report will help wisely allocate funds to support effective restoration. August 14, 2017- Students from both countries share solidarity and tour of rivers with dams in mind. August 9, 2017- Jefferson Public Radio hosts a 22 minute discussion of the fate of Waters of the United States rule. August 7, 2017- Illegal marijuana farms pollution is far worse than previously thought. August 3, 2017- Fifty teens and mentors paddle from the upper basin to the mouth to raise awareness for their respective rivers. August 1, 2017- Once numbering in the hundreds of thousands, last week's Salmon River dive found only 110 Spring-run Chinook. July 31, 2017- US House bill would redirect more Trinity River water to Central Valley irrigators, override recent court rulings. July 31, 2017- A primer on cyanobacteria and Upper Klamath Lake. History, monitoring, and what to do next. July 27, 2017- Part three of a three part series on the wildlife refuges in the Klamath Basin. 21 minute audio overview of series. July 26, 2017- First of a three part series on the wildlife refuges in the Klamath Basin. July 26, 2017- Second of a three part series on the wildlife refuges in the Klamath Basin. July 11, 2017- Summary of planned field activities for 2017. July 7, 2017- Copco Reservoir was posted at the Warning Tier 1 level based on microcystin toxins found on June 25th. See results and press release. July 7, 2017- Spring Chinook training and dive 25th-26th, Symposium on 27th, field tours on 28th. Symposium registration and agenda. June 7, 2017- Comments on the Integrated Fisheries Restoration and Monitoring Plan being accepted until July 7th. June 7, 2017- Blue-green algae toxins exceed Oregon thresholds at Eagle Lake County Park. May 23, 2017- A fact sheet is now available for vets to understand, diagnose, treat, and report blue-green algae illnesses. May 22, 2017- Learn the theory and practice of restoring rivers, streams, and floodplains at this upcoming training. May 19, 2017- Termination is requested due to unmet stipulations in the Upper Klamath Basin Comprehensive Agreement. May 17, 2017- Important study highlights threats to salmonids, including climate change, dams, agriculture, and urbanization. April 21, 2017- Final Environmental Impact Statement issued to guide response to prevent future fish die-offs. April 18, 2017- Call for water on Sprague and Williamson Rivers protects instream flows needed to replenish riparian habitat. April 14, 2017- Open house planned for discuss RFP, eligibilty, application, etc. on May 10 in Yreka. April 11, 2017- Annual Operations Plan describes expected water supply, irrigation, conservation, and operations. April 11, 2017- Record low run of Klamath chinook results in total salmon closure from Port Orford, OR to Eureka, CA. April 11, 2017- Map reveals long term trends for water quality in our nations rivers and streams over the last four decades. March 27, 2017- Sport and commercial salmon fishing could be completely closed due to projections of the lowest return on record. March 14, 2017- Agenda includes 15 talks, field trip to Terwer Creek restoration site. March 14, 2017- Advisory panel sees the worst outlook for fisheries that depend on Klamath since 2008. March 3, 2017- Despite uncertainty, the removal of four dams on the Klamath is still on schedule for a 2020 demolition. March 3, 2017- Now hiring for a Clean Water Project Manager for Willamette Partnership's Portland office. Job posting here, closing on 4/1/17. February 22, 2017- The Nature Conservancy is hiring for their Portland office. Applications due by 3/13/17. February 17, 2017- 2016 Klamath fall Chinook salmon run-size estimated to be lowest on record, going back to 1978, per CDFW report. February 13, 2017- Battles over water sent to fish in 2001 in court again as another court rules for more water for fish in 2017. February 10, 2017- Pulse flow begins 2/10 at noon, ramps up to 9,600 cfs for 24 hours, ramp down over three days. February 8, 2017- Low flows in Klamath River cause irrparable harm to juvenile salmon, court rules for pulse flow and other actions. January 30,2017- Expected order sides with tribes regarding low flows and higher than allowed juvenile disease rates. January 30, 2017- Grazing on 68,000 acres in Fremont-Winema National Forest temporarily halted. January 30, 2017- Cut off of irrigation water for fish during drought was federal taking without compensation. January 24, 2017- New report documents threats such as erosion, flooding, wildfires, and decreased snowpack. January 24, 2017- State-of-the-art science estimates phosphorous and suspended sediment loads using continuous monitoring data. January 10, 2017- Three days of talks, including a session on the Klamath! Registration here for this symposium at Skamania Lodge in Washington. January 10, 2017- State Water Resources Control Board releases their annual Citizen Scientist Calendar of events, activities, and other great links. January 10, 2017- The Klamath Bird Observatory and Trinity River Restoration Program summarized restoration progress using this unique and easy to understand report card. December 29, 2016- New DNA-based technique determines source of bacterial contamination. December 29, 2016- Innovative online mapping software will track salmonid populations. Press Release and Map. December 29, 2016- Future CA water funding will require data sharing, transparency, documentation, and quality control. December 21, 2016- "Restoring Watersheds and Rebuilding Salmon Runs" at the March 29-April 1, 2017 conference. 12/20/16- A USFS team examines water samples for environmental DNA to identify what aquatic species lives upstream. December 14, 2016- Links to EPA website here for proposed notice, fact sheet, and draft criteria to protect human health. December 9, 2016- The Yurok Tribe will be hosting the 20th KBMP General Meeting. More info here. November 28, 2016- Collection of Environmental DNA samples would provide unprescedented view into biodiversity. November 22, 2016- Presentations from the recent, and previous meetings, can be reviewed here. Will Klamath River Salmon Thrive Again After Dams are Gone? November 22, 2016- Dam removal is only one part of restoring a river and its inhabitants. October 20th, 2016- Six dam removal case studies on the fiscal, economic, environmental, and social benefits of dam removal. October 14, 2016- Open house and public hearing scheduled. Comments due on draft EIR by Dec 5th. October 6, 2016- PhyloChip can detect presence of 60,000 species of bacteria, better than traditional sampling. September 21, 2016- A story about creating fish abundance in a working agricultural landscape. Video- 12 minutes. September 6, 2016- Karuk and Yurok Tribes to work with feds on flow changes to protect salmon, hold off on lawsuit. September 1, 2016- To address water conflict, ranchers' center-pivot irrigation improves yields, uses less water. August 26, 2016- New flow and groundwater activities could set an example for balanced use in California. August 26, 2016- Supplamental flows will extend into late September to protect fall salmon run. August 24, 2016- Flows will supplement Lower Klamath River. Environmental documents also released here. August 23, 2016- The Klamath Tribal Water Quality Consortium has released its non-regulatory Upper Klamath Basin Nonpoint Source Pollution Assessment and Management Program Plan for public comment. Comments due September 18, 2016. August 19, 2016- Latest sampling by Yurok Tribe finds severely infected fish. See the latest technical memo here. August 18, 2016- New website features map based reporting and cyanobacteria information. Press Release and Fact Sheet. August 18, 2016- Riparian projects on Shasta River, Parks Creek, and Bogus Creek among newsletter topics. August 1, 2016- Snorkel survey finds only 389 adults for spring run chinook, half of 20 year average. August 1, 2016- Hoopa Tribe lawsuit filed; other tribes, environmental organziations filed notice of intent to sue. July 30, 2016- Finding solutions to expired agreements, water reliabilty, affordable power key to irrigators. July 25, 2016- Five key ideas to support environmental objectives during periods of low stream flow. July 25, 2016- Drought, disease, and poor ocean conditions drive low expected return of salmon. July 25, 2016- New study shows naturally occurring parasites decline in areas of cooler water, benefiting salmon. July 12, 2016- Advisory expands to all of Upper Klamath Lake; Raised to 'Danger' in Copco and 'Warning' in Iron Gate Reservoir. July 6, 2016- CalTrout leads a stakeholder driven effort to restore watershed through Eel River Action Plan. June 26, 2016- Howard's Bay in Upper Klamath Lake and Copco Reservoir exceed blue-green algae thresholds. June 25, 2016- Flow management blamed for more than 90% infection of juvenile salmon in 2014 and 2015. June 24, 2016- Wocus restoration may be getting easier but what will happen to the "Wocus Dance"? June 17, 2016- Water supply a concern this summer in California. June 17, 2016- Oregon wastewater utility to test drone for riparian planting, shoots seeds and fertilizer into ground. June 17, 2016- When beavers build dams, they create reservoirs that store water and replenish groundwater. June 15, 2016- NorWeST releases updated database, shapefiles, and temperature projections. June 1, 2016- BOR releases updated Iron Gate Dam Target Flow Schedule. May 18, 2016- Claims that nearly 100% infection rate of juvenile fish in 2014 and 2015 is linked to Klamath Project. May 5, 2016- Summary report issued documenting restoration progress from 2012-215. May 2, 2016- Dam removal offers hope to endangered salmon but doesn't provide water for refuges along Pacific Flyway. April 29, 2016- Klamath Lake Land Trust and volunteers are restoring and replanting 316 acres along the Sprague River. April 29, 2016- A reminder that dam removal is only the first step towards restoration of the Klamath Basin. April 28, 2016- Four trainings include June 20th at Humboldt State University. See all upcoming KBMP related events here. April 26, 2016- Latest newsletter highlights many programs and WQ related articles. April 25, 2016- Monitoring report for 1st BDA's in California, which create important slow water habitat for coho. April 18, 2016- 18th KBMP meeting on April 20-21 at Oregon Institute of Technology in Klamath Falls, OR. Agenda here. April 7, 2016- Warming is slower in high elevation headwater streams than low elevation streams, study finds. tribal leaders, and other dignitaries signed the amended KHSA and new KPFA. April 1, 2016- To be held April 20-21 at Oregon Institute of Technology in Klamath Falls, OR. Agenda here. April 1, 2016- Funding to establish or develop existing watershed groups. Applications due May 4th, 2016. January 19, 2016- Annual meeting in Yreka, February 2nd. Agenda here. January 19, 2016- The Klamath River means many things to many people. That's a big part of the problem. January 11, 2016- Aerial imagery provides new opportunities and insights for vegetation mapping and more. January 11, 2016- Op-Ed on how the years long effort to heal the basin died due to partisan politics. January 7, 2016- Accelerate strategic protection of healthy, freshwater ecosystems. Proposals due March 14th. 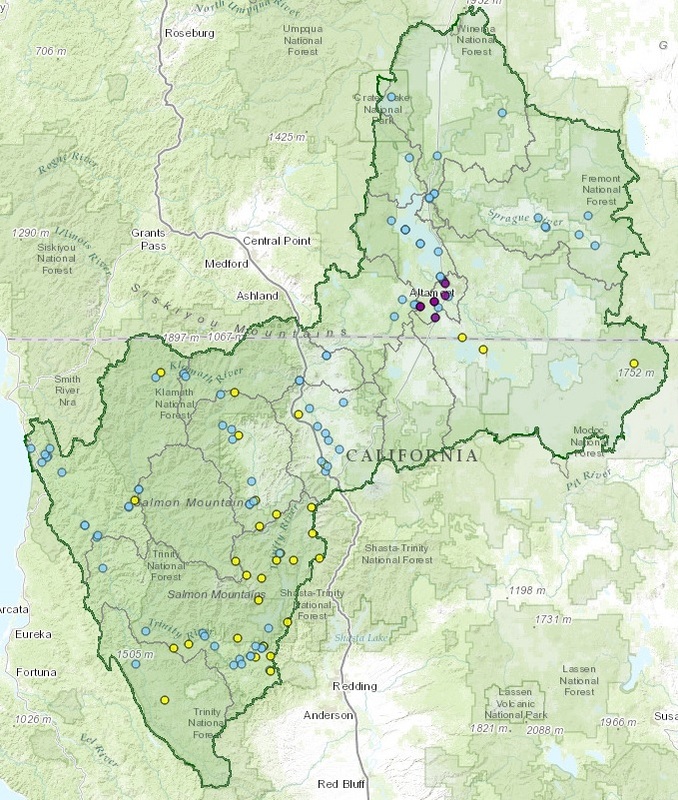 After the Klamath Agreements, What Next?